Dividend investors are probably familiar with the Dividend Aristocrats, a group of stocks in the S&P 500 Index with 25+ consecutive years of dividend increases. But investors might not be as familiar with the Dividend Kings, an even more exclusive group than the Dividend Aristocrats. While there are over 50 stocks on the list of Dividend Aristocrats, there are just 25 Dividend Kings. The Dividend Kings have each raised their dividends for 50+ years in a row. It is not easy to accomplish five decades of annual dividend increases. The past 50 years has contained multiple economic downturns, including the Great Recession. To maintain a dividend growth streak of 50+ years is highly impressive, and is a clear indication that a company has a strong business model and durable competitive advantages. Income investors looking for high-quality dividend stocks should consider the list of Dividend Kings. Utility stocks are great options for income investors. Not only do they have above-average dividend yields compared with the broader S&P 500 Index, but utility stocks can also raise their dividends each year like clockwork. For example, American States Water (AWR) has paid dividends to shareholders every year since 1931, and has increased its dividend for 64 consecutive years. American States Water is a water utility operating in California. The company’s operations consist of regulated water and electric utilities in California, and services for water and wastewater systems on 11 military bases in the U.S. The company serves approximately 260,000 water customers and 24,000 electric customers. Roughly 77% of American States Water’s revenue comes from its water and electric utility businesses, with 23% derived from the wastewater services business. The investment thesis for American States Water is simple. Water and electricity are necessities for modern society. They are highly regulated, which means American States Water is all-but-assured to generate consistent profits and steady growth. As you can see in the above image, American States Water grew its diluted earnings-per-share by 8% annually, from 2011-2017. Earnings growth has slowed down this year, due to higher-than-expected unplanned maintenance. On August 6th the company reported second-quarter earnings. Adjusted earnings-per-share declined by 12% over the first six months, due to elevated expenses. 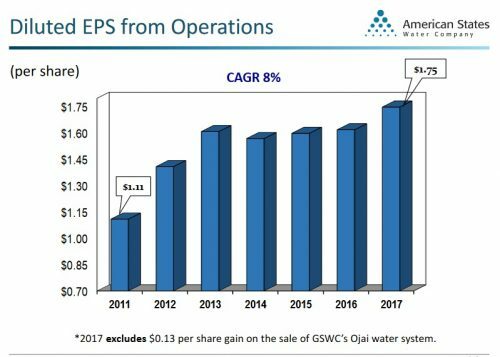 However, American States Water should return to long-term earnings growth, due to customer additions and rate increases. In July 2017, the company filed a general rate case application for all its water regions, which will determine new water rates for the years 2019, 2020 and 2021. The application requests approximately $125 million in higher rates each year for the three-year rate cycle. Its steady earnings growth over the long-term fuels its dividend growth. On August 2nd the company announced a 7.8% dividend increase. The company’s current policy is to grow the dividend by approximately 6% per year going forward. Another utility on the list of Dividend Kings is Northwest Natural Gas Company (NWN) is a natural gas distribution and storage company that was founded all the way back in 1857. Today, it serves approximately 740,000 customers in Oregon and Washington. The company, and its subsidiaries, also own and operate underground gas storage facilities in Oregon and California, with storage capacity of approximately 31 billion cubic feet and 14,000 miles of pipeline. It is also now engaged in water utility services. It has increased its dividend for over 60 years in a row. There should be plenty of room for future dividend increases, thanks to the continued growth of the underlying business. Like American States Water, Northwest Natural Gas’ growth is derived through customer additions and rate increases. 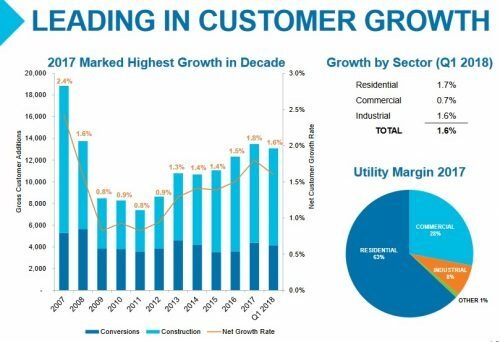 Over the next five years, Northwest Natural Gas expects 1.7% annual customer growth, as well as rate base growth of 4%-5%. Overall, the company expects mid-single-digit earnings growth each year. Acquisitions have boosted its growth opportunities. For example, in December 2017 it acquired Salmon Valley Water Company and Falls Water Company, two privately-owned water utilities. These acquisitions added more than 6,500 new customers to the company and diversified its revenue sources by expanding into water utilities. Northwest Natural Gas has a strong financial position, with a credit rating of AA-. This helps secure the dividend, as does its stable earnings. The stock has an attractive dividend yield of 2.9%. Lastly, industrial manufacturer Dover Corp. (DOV) has increased its dividend for 63 years in a row, and the stock has a current dividend yield of 2.4%. Dover has three operating segments, which are Engineered Systems, Fluids, and Refrigeration & Foods. Dover has a diversified customer list, which includes consumer products, automotive, environmental services, and the food industry. The company generates total revenue of approximately $9 billion each year. Dover reported second-quarter earnings on July 19th. 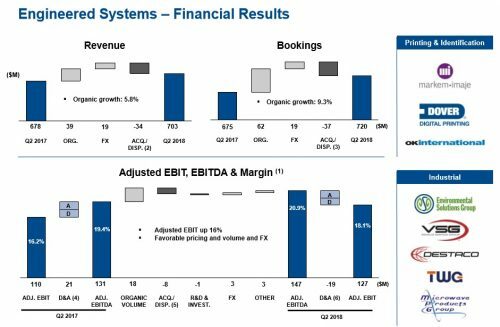 Revenue increased 3%, while adjusted earnings-per-share increased 21% year-over-year. The Engineered Systems led the way for Dover last quarter, with 19% segment EBITDA growth. Dover’s primarily catalyst for future growth will be continued expansion of the global economy. As a large industrial manufacturer, Dover is a bellwether for the broader economy. Assuming there is not a recession over the next few years, Dover’s growth should remain on track. It supplements its growth with an aggressive acquisition strategy. In 2018, Dover acquired Germany-based Ettlinger Kunststoffmaschinen to expand its fluids business. Dover expects 16% earnings growth for 2018. This is more than enough growth to continue increasing the dividend each year. The company provided a 2% dividend increase on August 2nd. Dover also returns cash to shareholders through share buybacks. The company is in the process of repurchasing $1 billion of its own shares in 2018. Dover has a highly secure dividend. The dividend payout ratio is likely to remain below 40% in 2018, which gives the company enough room for another strong dividend increase in 2018. The company also has a strong balance sheet, with a credit rating of BBB+ from Standard & Poor’s and Fitch. Dover has a current dividend yield of 2.4%.